Bird feeders come in many shapes, sizes, and styles. With this bird feeder tutorial, you can build a bird feeder with plexiglass sides to be able to view the amount of seed in the feeder. The top has a flip to open lid for easy filling, and the perch on each side is large enough to accommodate most songbirds. This is an easy project to build, one that will bring years of enjoyment. The first step is to cut the pieces for the edges of the base. Using a miter saw or circular saw, cut one piece of 1x8 cedar to 16-inches in length, and the second piece to 13-inches in length. These two pieces will be ripped to the proper width in an upcoming step. Additionally, cut two pieces of 1x8 to 16-inches in width. These will serve as the bottom of the feeder ​and will be ripped to 4-inches in width in an upcoming step. Cut the two pieces of dowel to serve as the perches on the sides of the feeder. Using a miter saw or circular saw, cut two sections of 1/2-inch diameter dowel to 16-1/2 inches in length. Set up your table saw fence to 2-1/4 inches from the right side of your table saw blade, and raise the blade to about 1-inch above the table. Be sure that the blade is set to 0-degrees (square to the surface of the table top). Rip the 16-inch and 13-inch boards into two 2-1/4 inch widths each. Set the leftover strips aside. Then, adjust the width of the fence to 4-inches, and rip the two pieces of for the bottom of the feeder. Position the two 13-inch long, 2-1/4 inch wide boards flat on a table. Measure in 3/4-inch from each end of the boards and make a mark with a pencil. Then, center the mark along the width of the board (1-1/8 inch in from each edge). Insert a 1/2-inch diameter drill bit into a cordless drill or power drill, then drill a 1/4-inch deep hole into each of the four pencil marks (two on each of the 13-inch boards). After drilling the holes in the 13-inch boards for the perches, it's time to do a little assembly. Measure in 1-1/2 inches from each end of the 13-inch boards (on the same sides as the holes for the perches) and make a pencil line. Then, place the 13-inch boards on edge with the holes facing each other. Position the 16-inch boards in between the 13-inch boards with the outside edges on the pencil marks. Then, slip the perch dowels into the holes. Assemble the base by nailing two finish nails through each intersection (nailing through the 13-inch boards into the 16-inch boards). Do not place any nails through the 13-inch boards into the ends of the dowels; the holes will hold the perches in place.Next, place the assembly flat on a work table and position each of the two boards that will serve as the bottom of the feeder into the assembly. There should be about a 1/2-inch gap between the two bottom boards, and the bottom edges of the boards should be flat on the table. Attach each bottom board to the assembly with a few finish nails through the edges of the base. With the perimeter of the base assembled, the next step is to cut the two pieces of cedar for the ends of the bird feeder to size. You'll cut the angles on these boards in the next step. Cut two pieces of 1x8 cedar to 9-inches in length using a miter saw or circular saw. Once you have two sections cut to 9-inches, set your table saw fence to 7-inches from the right of the blade, and raise the blade to about an inch in height. Turn on the saw and rip the two 9-inch long boards to 7-inches in width. Place each of the 9x7 end boards flat on a work table. On one of the 7-inch edges, make a mark in the center (3-1/2 inches in from each end). Then, working in from this end, make a mark on each side 2-1/4 inches along each side. Finally, on the opposite end, make a mark 1-1/2 inch in from each end. Draw pencil lines between the marks to denote the cut lines. Using a miter saw or circular saw, cut along the pencil marks to create the angled sides of the bird feeder. Before the ends of the bird feeder can be attached to the bases, there needs to be a groove cut into each side of the ends to accommodate the plexiglass. Set up your table saw with the fence 1/4-inch away from the right edge of the table saw blade. Adjust the height of the blade to 1/4-inch above the table. Turn on the table saw. Place one of the end boards flat on the table saw with one of the longest edges flat against the fence, and run the board through the saw, cutting a 1/4-inch deep groove in the side (1/4-inch in from the edge). Flip the board over and cut a matching groove along the opposite long edge (on the same face) of one end. Repeat by cutting two similar grooves in the other end board. Before moving on, there are three pieces of cedar that need to be cut to length and ripped. First, using some of the cutoffs left over from cutting earlier pieces, cut a piece of cedar to 1-1/2 inches wide and 14-1/2 inches in length. This piece will be placed over the gap in the base of the feeder, and it will serve to help push bird seed toward the openings in the feeder under the plexiglass. This piece will be added in an upcoming step. Then, cut two pieces of cedar to 3/4-inch by 3/4-inch by 6-inches in length. Place the two ends of the bird feeder (into which you cut the grooves above) flat on a work table with the grooves facing upwards. Align one of the two strips against the 4-inch edge of one of the end pieces (flush with the bottom of the end piece). Scribe the angles denoted by the sides of the end boards onto the strip, and cut each end of the strip along the pencil marks. Then, tack the strip into place on the bottom edge of the grooved face of the end board with some finish nails. Repeat with the strip on the other end board. This strip will serve as a stop for the bottom of the plexiglass, allowing bird seed to gravity-flow into the feeding area. With the grooves cut into the two end boards and the stop strips attached, it's time to attach the boards to the base. Position each of the two ends (with the grooves for the plexiglass facing one another) centered along the inside of the 13-inch ends of the base. The 4-inch bottom of each end board should be flat onto the bottom of the bird feeder assembly. Affix the ends to the base with a few 4-penny finish nails as shown in the picture above. It may be helpful to hold each of the ends in place with a small woodworking clamp before nailing.After attaching the two ends to the assembly, position the 13-inch long by 1-1/2 inch wide strip (which you cut in step 7) in between the two stop strips on the ends, positioned over and covering the gap in the bottom of the feeder. Tack the board in place with a couple of finish nails into the bottom boards. With the ends affixed to the base assembly, the next step is to cut the roof panels. Cut two pieces of 1x8 cedar to 18-inches in length using a miter saw or circular saw. Then move to the table saw and raise the blade to about 1-1/2 inches above the table and adjust the angle of the blade to 31-degrees. Next, position the fence so that the longest point of the rip will be 6-1/2 inches wide and rip one side of each of the two boards to form the two roof panels. With the two roof panels cut, the next step is to attach one of the two roof panels to the assembly. However, before that can be done, the plexiglass needs to be installed. Slip one piece of plexiglass into each of the matching sets of grooves on each side of the feeder. The top edge of the plexiglass should match the top edge of each end. If the plexiglass protrudes above the ends of the feeder, you may need to trim the plexiglass slightly so that it is flush. Then, position one of the roof panels over the ends so that the beveled edge is square to the base of the unit and flush with the peak on the ends of the bird feeder. Each end of the roof should overhang the edges of the feeder by one inch. Affix the roof panel in place (with three finish nails on each joint) and a hammer. With one half of the roof in place on top of the bird feeder, the next step is to attach the remaining roof panel to the bird feeder with the hinges. Position the remaining roof panel onto the roof so that the two beveled edges align and the ends of the roof panel match the stationary panel. Align the two hinges over the beveled joint on top (about four inches in from each end) and attach the hinges to each roof panel using the screws supplied with the hinges. Then, open and close the hinged panel to be certain that the roof panel opens easily and closes fully. The construction phase is now complete, and it is time to mount the feeder. The feeder can be mounted using an L-bracket (as shown) or it can be hung from a hook (as you'll see in an upcoming step). To mount using an L-bracket, simply position one edge of the bracket centered along the bottom of the feeder (as shown) and attach with a wood screw through each hole. Then, mount the feeder by attaching the L-bracket to the post or wall where the bird feeder is to be installed.To hang to the bird feeder, try using a long pair of eye-hooks (one through each end of the feeder about an inch down from the peak of the roof) and a chain connecting the eye-hooks. Alternate hanging method: You may wish to hang the bird feeder rather than mount it using a shelf or L-bracket. Hanging the bird feeder will typically keep the feeder from being accessible to squirrels, raccoons, and other four-legged critters. You can hang the feeder using eye-hooks and a chain. With the bird feeder mounted or hung in place, it's time to fill the feeder. 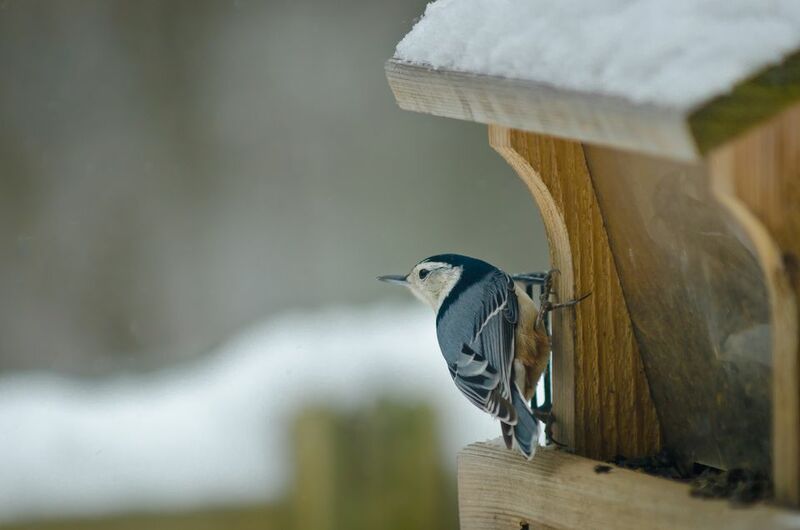 Lift the hinged roof panel, and pour your bird seed of choice into the top of the feeder. A limited amount of bird seed should flow through the openings at the base of the plexiglass, allowing the birds access to the seed. Flip the roof panel closed when the feeder is full.